William WREDE, The Messianic Secret, Cambridge/London : James Clarke, 1971. 22 cm. 292 p. £ 14,95. Martin DIBELIUS, From Tradition to Gospel, Cambridge/London : James Clarke, 1971. 22 cm. 311 p. £ 14,95. Daniel MARGUERAT (dir. 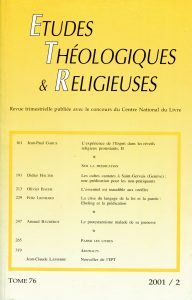 ), Introduction au Nouveau Testament, Genève : Labor et Fides, 2000. 23 cm. 489 p. ISBN 2-8309-0941-0. FF 180. Jerome D. QUINN – William C. WACKER, The First and Second Letters to Timothy, Grand Rapids/Cambridge : Eerdmans, 2000. 24 cm. LXXVII-918 p. ISBN 0-8028-2443-9. $ 65/£ 35.